Set of two postcards Been there, done that! 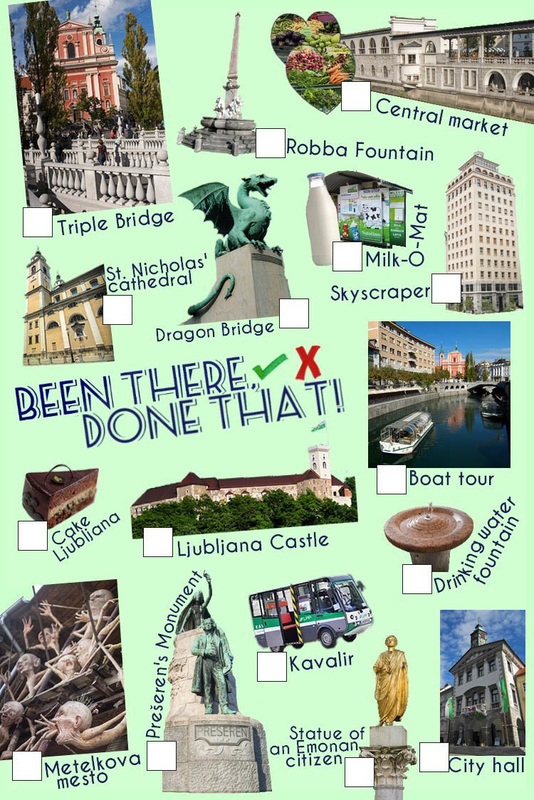 for Slovenia and Ljubljana with check boxes for most famous or a little bit less famous things that are a must to see or experience. 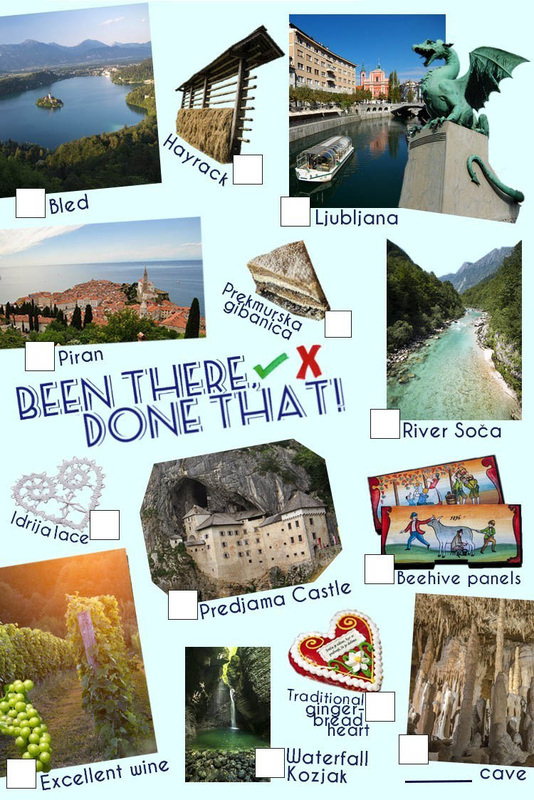 Slovenia - Been there, done that! BLED - Alpine gem has a lake and a little island with a church and a castle on a rock above the lake. HAYRACK - Typical Slovene wooden structure for drying hay. LJUBLJANA - Charming capital town with a lot of things to see and do. European green capital of 2016. PIRAN - Picturesque little town on the tip of peninsula stretching into Adriatic Sea. It has very nice Mediterranean feel. PREKMURSKA GIBANICA - A rich dessert from north-east of Slovenia made of four layers (poppy seeds, cottage cheese, walnuts and apples). RIVER SOČA - River with incredible emerald colour that flows through an amazing landscape. IDRIJA LACE - Lace making started half a millennium back in a little mining town Idrija. PREDJAMA CASTLE - Castle with the most amazing position in the middle of the precipitous rock. BEEHIVE PANELS - Painted wooden fronts of bee hives are probably the most authentic Slovenian souvenir there is. WINE - Viticulture has been present since the Romans and you would be surprised with how many good wines you can drink here. GINGER-BREAD HEART - Traditional Slovene love gift. ​Ljubljana - Been there, done that! TRIPLE BRIDGE - It is one of many Plečnik's inventions that can be easily called the centre of Ljubljana. ROBBA FOUNTAIN - The most beautiful baroque fountain in front of the City hall. CENTRAL MARKET - Pick up some fresh vegetables, fruits, dairy products and many more from farms around Slovenia. Market halls were designed by architect Jože Plečnik. ST. NICHOLAS' CATHEDRAL - The most important Slovene church will impress you, even if you are not a church fan. DRAGON BRIDGE - It is absolutely a must taking a picture with Ljubljana dragon, city's symbol. MILK-O-MAT - Word play that stands for vending machine for fresh unskimmed raw milk. SKYSCRAPER - Built in 1933 was for some time the highest building in Central Europe. BOAT TOUR - See Ljubljana from River Ljubljanica, strolling through the city centre. CAKE LJUBLJANA - Sweet Ljubljana cake made of ingredients from all over the country. LJUBLJANA CASTLE - One of the most visited places in the country offers a beautiful view over the city. DRINKING WATER FOUNTAIN - Since our tap water is potable, there are many little fountains where you can refill your bottle or just have a sip of fresh water. PREŠERN'S MONUMENT - This is the meeting point for people in Ljubljana, always lively. KAVALIR - Electrical vehicles that are driving (slowly) in the pedestrian zone in the centre and are free of charge. STATUE OF AN EMONAN CITIZEN - Gilded bronze statue of a citizen from Emona, Roman city on the grounds of Ljubljana. CITY HALL - The site of city's authorities since 1484. You can freely visit the arched courtyard that has some interesting pieces of art and always changing exhibitions.